Another source of high energy bills in the dwelling is the heating of hot water for showers, baths, dishes and other needs. The process of heating all this hot water takes a lot of energy and oil/gas and this is where solar heating can help dramatically. Thankfully nature has provided a means to offset the cost of heating our hot water via the sun. Energy from the sun is free, clean and abundant. There is a widely held opinion that Ireland does not have enough “sun” to make solar systems worthwhile. In fact parts of Ireland especially the south and south west have annual solar reduction levels equal to 60% of those experienced at the Equator. A well designed system will provide typically up to 100% of a family’s hot water requirements during the summer months of April to September and make a useful contribution during the rest of the year. In a typical year, overall the system will provide 50-60% of a family’s annual domestic water heating needs. One of the main advantages of solar water heating is its ability to reduce the use of fossil fuels and thereby to help limit the emission of harmful “greenhouse gasses”. What happens when your hot water cylinder is fully heated and it is still sunny outside? Your solar system is designed to deal with this situation. Your solar controller is programmed to shut off your solar system when you’re hot water cylinder has been fully heated. This ensures that the water in your cylinder never over heats and risks very hot water coming out of your taps. Your solar controller is programmed to shut down the solar system when you’re hot water cylinder reaches a temperature of 60C at the bottom of the cylinder. This temperature is chosen because it is a safe temperature to store hot water both by not being too hot and protecting people from scalding and also not too cold to reduce the risk of legionnaires. When the cylinder is fully heated the solar controller shuts down the solar system. This will generally happen after a number of sunshine hours and the initial energy has heated the cylinder completely. The temperature of the fluid in the solar collector will begin to heat up significantly. This will lead to a build-up in pressure in the solar system. This is where the expansion vessel of your solar system begins to work. While the heated fluid will only be located on the roof the pressure will pass back down the pipe work into the solar expansion vessel. The membrane will flex to allow for the increase in pressure. This process is a full safe process and how the system is designed to work. Air source heat pumps absorb heat from the outside air. This heat can then be used to heat radiators, underfloor heating systems, or warm air convectors and hot water in your home. An air source heat pump extracts heat from the outside air in the same way that a fridge extracts heat from its inside. It can get heat from the air even when the temperature is as low as -15° C. Heat pumps have some impact on the environment as they need electricity to run, but the heat they extract from the ground, air, or water is constantly being renewed naturally. Heat your home with energy from the ground. Ground source heat pumps use pipes which are buried in the garden to extract heat from the ground. This heat can then be used to heat radiators, underfloor or warm air heating systems and hot water in your home. A ground source heat pump circulates a mixture of water and antifreeze around a loop of pipe – called a ground loop – which is buried in your garden. Heat from the ground is absorbed into the fluid and then passes through a heat exchanger into the heat pump. The ground stays at a fairly constant temperature under the surface, so the heat pump can be used throughout the year – even in the middle of winter. The length of the ground loop depends on the size of your home and the amount of heat you need. Longer loops can draw more heat from the ground, but need more space to be buried in. If space is limited, a vertical borehole can be drilled instead. Unlike gas and oil boilers, heat pumps deliver heat at lower temperatures over much longer periods. During the winter they may need to be on constantly to heat your home efficiently. You will also notice that radiators won’t feel as hot to the touch as they might do when you are using a gas or oil boiler. 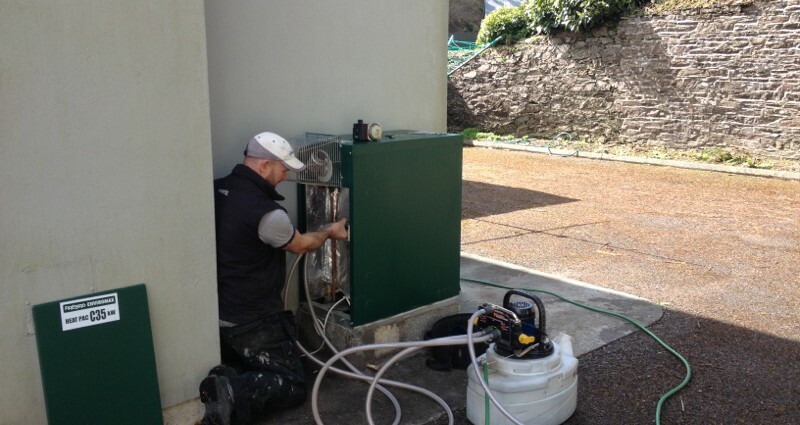 Air source heat pumps are usually easier to install than ground source as they don’t need any trenches or drilling, but they are often less efficient than ground source heat pumps. How do ground source heat pumps work? Heat from the ground is absorbed at low temperatures into a fluid inside a loop of pipe (a ground loop) buried underground. The fluid then passes through a compressor that raises it to a higher temperature, which can then heat water for the heating and hot water circuits of the house. The cooled ground-loop fluid passes back into the ground where it absorbs further energy from the ground in a continuous process as long as heating is required. Normally the loop is laid flat or coiled in trenches about two metres deep, but if there is not enough space in your garden you can install a vertical loop down into the ground to a depth of up to 100 metres for a typical domestic home. Heat pumps have some impact on the environment as they need electricity to run, but the heat they extract from the ground, the air, or water is constantly being renewed naturally.